Talk about anything related to DoMO, this forum, or anything in general here. Relevant Announcements will also be posted here. Sometimes, Softstar will provide compensation to players for server issues or bad patches etc. In the past they have sent these directly to players, however you now need to accept these compensation items on the website. Some events also have reward items distributed through this method. 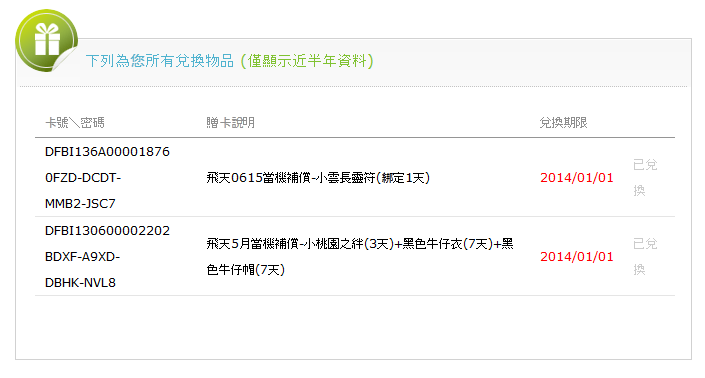 For example, on 06/15 there was this post offering compensation of a 1-day 50%/50% badge. In order to claim this compensation, and other compensation items you may have, you need to visit this link, which will require you to login first if you have not done so already. The keys for all the compensation items your account is entitled to will be listed here. If there are no keys, your account did not exist at the time the compensation was sent out, or the key for the compensation has already expired. Click on the Exchange link (兌換) as noted in the image to begin the process. 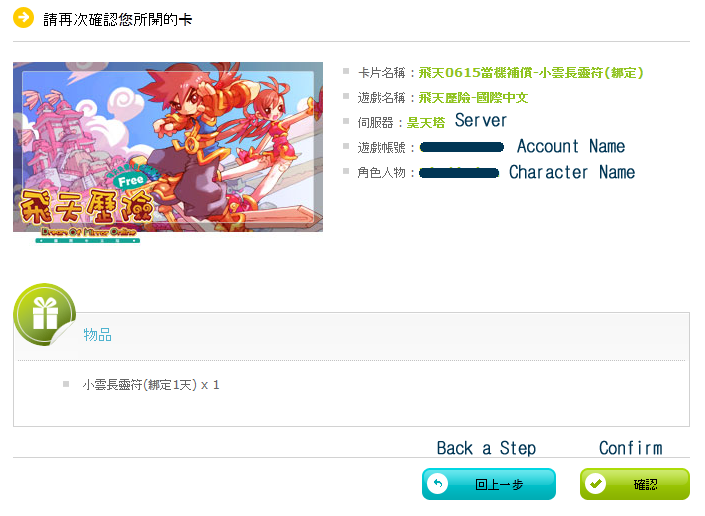 Here, you need to select your server account and character to receive the item(s) using the drop down boxes. After you have made all your selections, Click on Forward a Step (下一步）. Before you move forward a step, you MUST log out your character. If you do not log out, you will be able to move to the next step, but will not be able to complete the process. This page is the confirmation page. The information you have selected is listed, and you are able to make the confirmation to send out the items here. 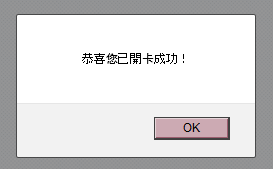 After making sure that your character is indeed logged out, click on Confirm (確認) to send out the item(s) for that code to your character. If the transaction completed successfully, you will see this message. If not you will see a different message telling you to please log out first. After this you can go back to the redeem card page. Follow the same steps here to exchange all the compensation card keys you might have. After you have successfully redeemed the compensations, the redeem card page will look something like this. The link will be gone and replaced with 'Already Exchanged' (已兌換). You are done and may log back into your character to receive the items. Anyone who participated in either or both of these events may claim their rewards now using the instructions as above. Between the dates of 2014/1/24 00:00～2014/2/1/ 23:59, topping up the specified number of points into your account. Between the dates of 2014/2/2 00:00～2014/2/5 23:59, spending the specified number of points. If you have not used the item mall during these specified periods, there is nothing to claim. Anyone who participated in this event may claim their rewards now using the instructions as above. 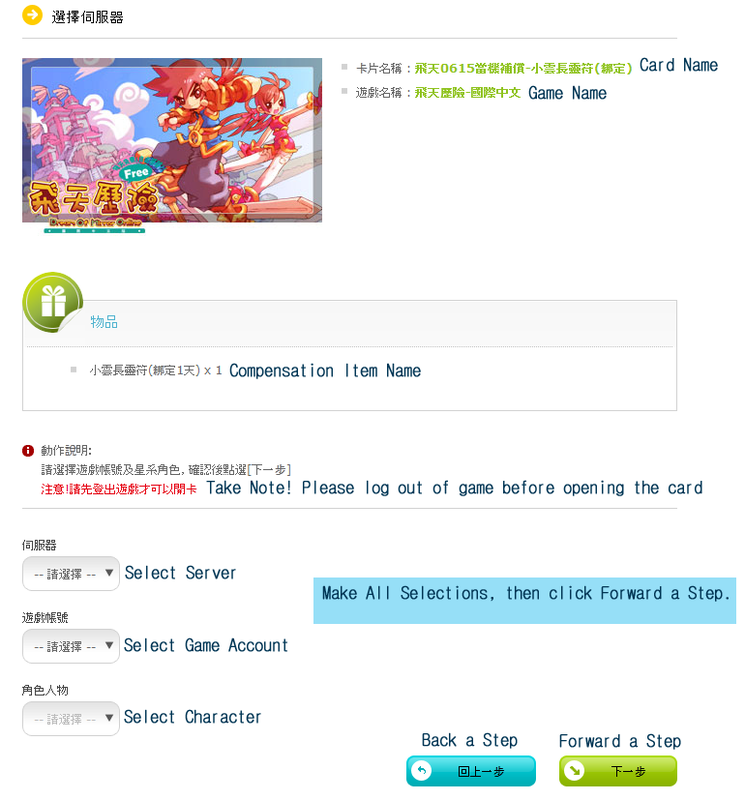 Between the dates of 2014/7/17 00:00～2014/7/24 23:59 (Taiwan Time), topping up the specified number of points into your account. If you have not used the item mall during this period, there is nothing to claim.